Michael Sumner, an emergency room nurse at Sentara RMH in Harrisonburg, earned an award for compassionate care in May, and days later, a second award for a research project. He is a 2015 graduate of Eastern Mennonite University’s nursing program. Sumner’s first recognition came in May with the DAISY Award, which honors extraordinary nurses through a national program called The Daisy Foundation. Founded in 1999 by the family of a patient who spent eight weeks in the hospital, the program honors selfless service and compassionate care of nursing professionals. More than 2,500 healthcare facilities in all 50 states and 15 other countries partner with the foundation to provide this recognition. Nurses at Sentara RMH are nominated by a co-worker, a family member of a patient, or a patient. At the end of a month, a committee makes a blind selection. Nursing is Sumner’s second career. Although he worked in emergency services as a 911 dispatcher and Emergency Medical Technician (EMT), he always wanted to be a nurse. “It was always a dream of mine. My mom is a nurse and my wife is a nurse. She really supported me,” Sumner said. Sumner formed a team with fellow December 2015 EMU graduates Vanessa Yoder and Kelly Perry, and Anna Burrows, a graduate of James Madison University. The group investigated protocols and management of stroke victims receiving Alteplase during ground transport by emergency medical services. After successfully presenting the poster in February at the conclusion of the residency program, they were encouraged to compete in Sentara’s annual Nurse Leadership Academy. There, out of about 30 other posters, they earned a first-place ranking. Sumner says he was well-prepared by EMU’s nursing program for the challenges of his profession, and also the demanding setting of the emergency room. 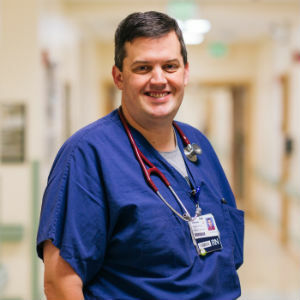 On demanding days, he’s inspired by the teamwork of his colleagues in the ER, “a simple thank you, a smile or a handshake from a patient or family member for the care that we provided,” and his supportive and compassionate wife.